Sometimes, there is this feeling of being neither there nor here. You think beyond your usual boundaries, you decide to take a bold next step, but then pull back halfway through. The courage that you felt before suddenly slips away, and you feel that maybe pushing boundaries beyond a certain stage is not good. And then you compromise and tell yourself that what you've done so far is different enough, and that after this, you will follow the usual path. This halfway mark is exactly where Sukumar is stuck with in his latest film, 1-Nenokkadine. It is clear that he wanted to take Mahesh Babu away from his regular love/action stories. He wrote a detailed script with several twists thrown in, and decided to make a dark movie without many commercial elements. He also decided to shoot abroad extensively, and found producers who backed his vision. But then, he fell into his own trap. Let us tell you how. 1-Nenokkadine is the story of Goutham (Mahesh Babu), who goes to a police station and confesses that he has killed three people who have killed his parents. When the police start looking into the story, they find that he was fighting with shadows and has not actually killed anyone. He is taken to a psychiatrist, who says that Goutham suffers from some kind of a mental disorder due to which he imagines that someone has killed his parents and is out to kill them. Were Goutham's parents really killed? Did Goutham kill anyone, or is it all his imagination? How will Goutham find the answers to these questions? These are some of the questions 1-Nenokkadine attempts to answer. Please note that we only said some - the film raises and convincingly answers these and several other questions. Now the question-and-answer part is where Sukumar does well. He brings in several threads, and ties them all up in a pretty convincing fashion towards the end. There is a sophistication in the treatment of the script, and an extremely multi-layered screenplay that we do not find in Telugu movies in general. You really have to follow the movie to understand what is happening and where it is leading to. Further, there are no separate comedy tracks, and most of the comedy is situational and laugh-worthy. These are all the good parts. But then, Sukumar's doubts seem to have gotten the better of him at some stage during the long shooting schedule. He puts in four regular songs and one "item" song. He makes Mahesh Babu dance during the songs, something that he is not known to do. He gets Ratnavelu to shoot some superb visuals in Goa, London and Belfast, and harps for too long on these visuals and chases in the first half. The chases follow the theme "oh-look-at-all-the-chases-with-the-gorgeous-visuals-we-shot". These so-called commercial elements make the movie go on for too long. 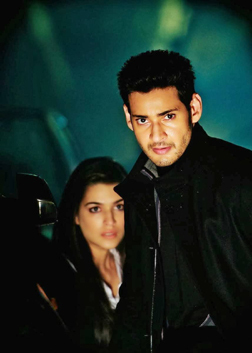 Mahesh Babu puts in an outstanding performance as the vulnerable rockstar. He takes the film's responsibility on his shoulders, and carries it through with his trademark intensity. He dances well enough to send his fans into a tizzy. The heroine, Kriti Sanon, acts well enough, but this thriller needed more pace and less distraction. She is given a significant role in the first half and acquits herself well. The supporting cast of Kelly Dorjee, Pradeep Rawat, Nasser, Sayaji Shinde et al have bit roles, so to speak, and do what they are told. The visuals, like we mentioned earlier, are outstanding. The songs are decent, but the background score is very good and complements the thriller theme of the movie well. The stunts are all well directed, but again, they could have really cut them short. 1-Nenokkadine is a truly different film from your regular Sankranthi entertainer, but it is weighed heavily down by the desire to be different and yet fit in to the commercial mould. If you have to go, do so without being influenced by the hype and hoopla and Mahesh Babu's stardom (if that is possible). After a recollection of his childhood memory in which he confronts a police officer after being chased by three men, Rockstar Gautham (Mahesh Babu) wakes up in a state of shock. He goes on to perform in his concert in Hyderabad and he sees one of the three men (Kelly Dorji) and starts chasing him. He escapes in a car while Gautham chases him on his bike. This chase ends at a Container Yard where Gautham kills him by stabbing him with a broken bottle and surrenders himself in the police station. Inspector John Basha (Sayaji Shinde) takes him into custody. At I News channel, a reporter Sameera (Kriti Sanon), who followed Gautham and shot the entire sequence on her video camera airs the video. It shows that Gautham imagines Kelly and the entire incident was only his hallucination. The movie focuses on the continuation of Gautham's recollection in which he tells the police officer (Prabhu) that his parents were killed. He takes the policeman into a bus and shows the spots where his parents were killed. However there are no blood stains in the bus. The driver (Narsing Yadav) and conductor (Kadambari Kiran) inform the policeman that the child keeps imagining things and nobody was killed there. The police officer enrolls Gautham into an orphanage from where, after a point of time, he ran away. The story shifts back to the present where after a medical check-up, doctors confirm that Gautham is suffering from Depersonalization disorder and there is 25% less grey matter in his brain which blurs his capability of differentiating reality from imagination. At this juncture, the one who Gautham imagined he killed is shown to exist and his name is Antonio Rosarius (Kelly Dorji), a Mongolian businessman and criminal residing in Goa. Antonioâ€™s company products are identified to be harmful by a NGO member. Antonio has a talk with the member and he warns that the whole world would know if Antonio kills him because his friend knows about their meeting. Antonio doesnâ€™t care and gets him killed. One day, while Gautham is arranging a Rubikâ€™s cube in his unique way, some men enter his house. Gautham takes their photographs and attacks them. They flee and officer John Basha gets information about this. Media personnel enter Gautham's house and pester him about the attack. He doesn't reply and sets out for the airport. An old man (Nassar) calls out his name but Gautham ignores him. At the airport, after assigning three given choices - Mumbai, Goa and Delhi to each of the footsteps of a child, he selects the last footstep which corresponds to Goa. The woman at the counter is Sameeraâ€™s friend and she informs her about Gauthamâ€™s Goa trip. Sameera is extremely fond of him and she travels to Goa. She enters his yacht for an interview, but he gets annoyed and sends her away. She comes again and says that this was her first appearance. Gautham assumes that the previous encounter was his hallucination. She asks him to come to the shack in the evening for some coffee. He decides to meet her, but she takes out a camera for an interview. He scolds her for deceiving him and she leaves. Sameera's re-entry into the shop in a different dress and hair style makes him assume again that the previous conversation was a hallucination. This time, he touches her to confirm that she is real. Itâ€™s shown that what he had imagined was actually real i.e. Sameera changed her dress and entered for the second time and her friends capture this on her handycam. While they stroll on the beach, a speeding car tries to knock Sameera out. Gautham visits the Goa carnival where Sameera meets him and asks him to let her be his girlfriend for one day. While they are talking, a boat hanging on by the support of a crane falls down but Gautham saves Sameera in time. Later, he hallucinates the presence of Antonio and tries to attack him. To get rid of Sameera, Gautham drugs her and takes her to his yacht. The next morning, his yacht is set on fire by Antonioâ€™s men and Gautham saves himself and Sameera. They escape on a boat and crash on a lonely island. At the island, Gautham tries warn Sameera but Sameera rubbishes everything. Gautham finds her handycam which gives him proof that she was acting as if she was two people - a reporter, and his admirer. He asks her about her life and Sameera tells him that the reporter was a lie. Gautham shows her the footage of Sameera in the handycam. He tells her that his past not imaginary and he wished that her love was true. The next morning, he watches a footage in which she admits that she believed in his past. She wanted to prove that he imagines other people too apart from the three killers. So, she pretended that she was his imagination so that his mind can respond to treatment. Gautham is suddenly attacked by Kellyâ€™s men but they leave without killing him. He meets Sameera and warns her again that someone wanted her dead, and not him. She decides to leave to Hyderabad and Gautham meets her at the Hyderabad airport and tries to convince her. Meanwhile, Antonio's men reach Hyderabad and plan for her murder. One night, while Gautham is keeping guard outside her flat, Gautham mistakingly thrashes Sameera's friends. He apologizes and accepts that nobody is trying to attack her. Antonio's men find them and hit Gautham. He assumes it to be another hallucination and doesnâ€™t react until Sameera is injured. He fights with them and Sameera reconciles with him. She tells him that she knew why someone was trying to eliminate her. She meets her boss (Banerjee) in a hotel and tells him that she tried to expose the role of Antonio's company regarding seeds containing Hydrogen Cyanide. She also tells him that the NGO member who was killed had informed her about his meeting with Antonio. Banerjee says that Antonio offered him R500 million and that he would spare Sameera if the news is not telecast, or else they would be killed. Meanwhile Gautham and Antonio are in the men's room where Gautham thinks that Antonio is imaginary and kills him. Sameera goes there and then Gautham realizes that Antonio was real and he shouldnâ€™t have killed him. Gautham and Sameera check the photos in his camera and he finds 12 pictures each with a cellphone digit. When he individually zooms in, he finds the phone number dialed. He calls that cell number which is answered by an old cab owner (Nassar) who tried to talk with Gautham in the past while he was on his way to the airport. Nassar tells Gautham that he feared he would kill him so he sent his men to his house to get any misunderstandings cleared and he was a taxi driver in Goa. On that day, two people boarded his taxi and and told him to follow the bus in which Gauthamâ€™s parents were travelling. One of them was Antonio and the other man was from London. These two people kill Gauthamâ€™s parents while he runs away. Nassar enters the bus and Gautham's dying father gives him a small bag which contains a Rubik's cube with scratches, a British currency coin and a key. Gautham is chased by the two assassins and Nassar urges them to spare the child. Gautham thinks that all three were the killers. The two assassins blackmail Nassar and they bury the dead bodies at a church. After visiting his parents' grave at the cemetery, Gautham takes the bag from Nassar and decides to go to London to kill Pradeep Rawat. Sameera cannot stay without him so she accompanies him. Gautham informs his London event manager, Michael about his trip and he sends driver Gulab Singh (Posani Krishna Murali) to receive them at the airport. A fan of Gautham (Naveen Polisetty) recognizes him and requests him to travel in his car but Gautham refuses. On their way from the airport, the taxi is attacked on a bridge by a truck but they manage to escape. Gautham is now suspicious of Michael and tracks down Michael but before he can talk to him, he is shot dead. Gautham chases the shooter, but it turns into a futile attempt. A frustrated Gautham is approached by Sameera who tells him that the Rubik's cube may hold some clue. After solving it, he finds that the cube bears a password and the symbol of a bank that Gautham observed during the chase. At the bank after showing the password and using the key, he finds a rice grain enclosed in a glass rod. In the parking area, some bikers chase them causing havoc there. Gautham hides Sameera in a car and starts fighting with them. He escapes from there and crashes into a police vehicle. However he is terrified as he picked the wrong car. Along with the police, he reaches the parking area where everything seems normal and Sameera is not in any of the cars. Gulab Singh arrives and says the fight was his imagination and Sameera was not in London at all. He explains this to the police and Gautham gets arrested. Two people come for him and one of them is the fan, Naveen, who met Gautham at the airport. They bail him out and Gautham calls Gulab Singh and confirms that Sameera is with him which implies Gautham's plan.to get himself arrested. After shooting the other one in his leg, Gautham turns to Naveen who takes him to a place where his questions can be answered. After seeing the place Gautham recalls that during his concert at London, he saw and chased one of the murderers (Pradeep Rawat). While he was questioning Rawat, a car hits him which leads to his death. Naveen reveals that he is Rawatâ€™s son and is trying to avenge his father's death. He planned the truck attack on the bridge. Gautham asks him why he killed Michael to which he replies that he didn't do it. The injured one tries to escape in a car but Gautham shoots him. When his mobile receives a call from his boss, he finds out that the boss is Nassar. Naveen says that his father was a taxi driver in Goa. Gautham realizes that Nassarâ€™s story was a lie. Pradeep Rawat was actually the taxi driver and Nassar was one of the killers. Antonio and Nassar blackmailed driver Rawat and offered their help in getting him a visa so he could move to London. It was Nassar who killed Rawat in London and both of them were travelling in the same car which was chased by Gautham. Gautham confronts Nassar who owns a multinational company for Seeds and Agriculture based products. He asks him about his parents and this time, Nassar narrates the true story. He and Gautham's father were friends and Gautham's father discovered a hybrid variety of rice grain â€“ Golden Rice, which can withstand any climatic condition. When he was asked to sell it for a price, Gautham's father refused saying that he would distribute it for free out of patriotism. Nassar gets hold of the seed and plans to kill Gautham's parents when they were attending a carnival in Goa. Before dying, his father scribbles the password and bank symbol on the Rubik's cube and rearranges it. The seed which Nassar had was a bogus one. Gauthamâ€™s father had hidden the real seed in a bank locker in London. Along with the key and a coin, he gives the cube to taxi driver Rawat who hands it over to Nassar. Gautham requests him to tell how his parents looked, but words fail and bullets speak with Gautham killing him. While on his way back to the hotel along with Sameera and Gulab Singh, Gautham observes a school bus and some kids singing a rhyme. It triggers a recollection and he recognizes that it was the place where his school bus used to stop. Every landmark was compiled as a rhyme in his childhood by his mother (Anu Hassan) so that he won't forget his way back home. He follows the landmarks in the rhyme and eventually reaches his abandoned home. Every room reminds him of his childhood. He opens a book and finds his drawings, writings and photos of his family. Gautham recollects everything about his childhood including his father's name, Chandrasekhar (Anand Babu). After globally introducing the special variety developed by his father, the film ends with a scene where Gautham is shown standing in a field of Golden Rice. Nice movie after several years..
1) What caused Gautam's memory loss??? 3) Where has Gautam seen Kelly Dorjee to imagine his face and pony tail??? the murders were wearing masks when they killed his parents?? 4) How the hell did he become a Rockstar? what's the background? Nasser says he admitted him in orphanage? How come he never remembered or imagined Nasser? 5) What is this Sameera thing? She says she is doing a research on a pharmaceutical firm and people are trying to kill her?? Why is that thread abandoned? 6) And why would she accompany Gautam to Belfast? Is she an government agent or a reporter? 7) Where did the love develop between Gautam and Sameera all of a sudden? 8) Why did they go to Goa at all? 9) Their boat is set on fire. If Nasser wants Gautam alive, was he trying to kill Sameera? If so, why would he risk killing Gautam along with her? He would rather kill her in the city? No? 10) If Nasser wanted to give the Gautam Key, Cube and the Coin, does he have to send goons to his home? Doesn't he have a better way to deliver? 12) if Gautam's father never trusted Nasser and kept the golden seed in a bank, why would he ever bother to go to Nasser for testing and give him the fake seed?? 13) Gautam is a school kid of 7 or 8 years old and he has never remembered he studies in England and his parents' faces? If he had studied in England, he never remembered learning telugu in the orphanage? 14) In the parking lot, Gautam suddenly announces they were going to be attacked? How did he get that 'omen'? plz watch the movie again and then ask these, i bet half these questions will go away. Nasser did not set the boat on fire it was kelly george and there are many. I bet you would have watched naayak, baadshah, racha, business man type of movies. You are prejudiced about sukumar and that is the reason for your illogical comments. Has it crossed anybody's mind that this movie is a copy of Bourne series? Best Movie Telugu cinema could deliver in recent times that is being appreciated internationally. Thank you Sukumar! I happened to watch both 1 and yevadu over this weekend.I dont watch Telugu movies often ,nor am i a fan of any * s .Heres my review : 1 - Wont be appreciated by normal audience or Mahesh's fans who are just looking for routine entertainment.Its a good attempt by director to make a pschyo thriller ,but the thrills fizzles out in the second half.The convoluted screenplay poor editing unnecesary & over the top fights ans songs dont help either.Mahesh looks good & performed well but . Even though you tried to hide the fact that you are Ram Charan's fan, it is clear that you are biggest fan of Ram Charan. Do not try to make us believe that you are neutral. yes, as all the other commenters mentioned rating is not correct for this movie. Maybe the reviewer also needs to watch it 2nd time :) I usually go by your reviews but this time you are wrong. I am glad I watched the movie against the recommendation of your review..
Editor did not like MB, he may be fan of PK. However, you should be genuine on his review. yeeven gud muvviss yand gud yactors will flaap be4 RomeChar??. Mind it! Why fret so much about ratings from a particular review and single him out? For instance, here are some "ratings" for other movies from the same reviewer! Seeing the above average ratings for these movies, at least, I didn't rush to see these duds! In fact, I never saw them nor intend to. the problem with this movie is that you have to watch it atleast twice to fully understand and appreciate the screenplay and concept...seems confusing and weird when you watch the first time because we are not accustomed to such movies. This is one of the best movies & best performance from Mahesh to date. Same case with BGM & script. It looks like its not sukumar who got struct in the middle, its the reviewer who can't give a good rating for a film he liked. I think the reviewer has rated the movie as per Telugu movie norms and not based on the movie itself. Like all I too agree that rating doesn't match with the words of the reviewer. Its a good movie. For me there are two heroes in this movie - Mahesh for his action and Sukumar for his direction. This is not a typical fan-boy rant, I was really interested in watching nenokkadine before its release but after reading so many not-so favorable reviews, I was unsure and your review made me believe I should give it a miss. Coz unfortunately I was under the feeling all these days that I can count on your consistency. But still I watched it coz somebody forced me into it. 4 for script & 6 for visuals!! I mean, seriously?? Don't tell me you were expecting a Christopher Nolan's script or Ang Lee's Life of Pi kinda imagery.. It was only the music which I felt failed to complement the movie, otherwise it was ok.
Look at the disparity between your words & the rating! Its like saying, "ok.. its not a regular movie, you may not get it & its not for you.." I seriously have a feeling that you look down up on your readers..
fullhyd.com has 700,000+ monthly visits. Tell Hyderabad what you feel about 1 Nenokkadine!